Vote for incoming slate of Directors, hear goals and plans for the coming year, meet committee chairs, sign up to volunteer! 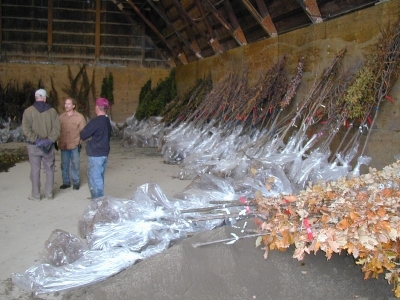 Left -Trees were unloaded and sorted at Amherst Highway Department for various WNY locations. 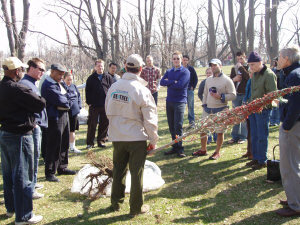 Right -Buffalo block club leaders learn bare-root tree planting in Delaware Park. 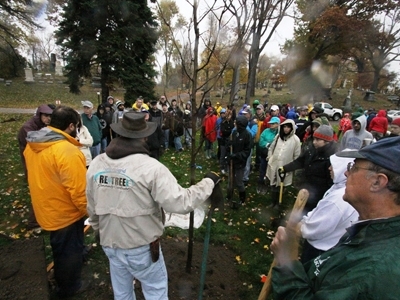 In 2006 Re-Tree WNY was established to re-plant trees lost in the October storm of 2006. Since Arbor Day of 2007, they have planted over 28,000 trees and hope to reach their goal of 30,000 trees planted this year! Meet at First Presbyterian Church, Wadsworth side. Groups of 3 will plant trees in pre-assigned spots in Allentown. All are welcome! Ages 4-84, not just Allentown residents. Community Service volunteers encouraged to join. Wear layers of outdoor clothing with suitable shoes; bring gloves, scissors, and a shovel, if possible. We always need extra sledge hammers for the tree stakes. We’ll provide coffee, hot chocolate, and donuts to all who volunteer! Help us reach our goal of 30,000! Interested in finding out more about Re-Tree WNY, making a donation, or finding a tree-planting in your area? Copyright © 2018 Allentown Association, Inc., All rights reserved.